If you loved the original Doctor Love slot, then you will definitely love this one where he takes some time out of the office. In Doctor Love On Vacation, he’s trying to fix a woman’s poor luck in love in a tropical location. This is a 5 reel slot by NextGen. Help Dr. Love turn into cupid and make it happen for a short, bald, fat guy with a bubbling personality and a feisty woman always falling for the jerks who never appreciate her. Your reward for helping the doctor succeed include bonuses and rewards when you find special symbols like deck chairs, beach-balls, candy, etc. and help him set the ambience for love. Stakes begin from as little as 0.01 coins. NextGen has been around for as long as the online betting revolution has been active. 1999 was the start of the online casino and video poker empire and it’s the same year NextGen was founded. The company has its headquarters in the UK and offices in Australia and Sweden. NextGen provides its services on a global scale- providing casino operators with customizable and modern gaming solutions. Their games are reliable solutions for the operators and fun for the casino patrons. Their games are available on so many different software platforms, that it’s not uncommon to be playing a NextGen game without knowing that it’s one. Stethoscopes, sun and sand count as a lethal love combination in the hands of Doctor Love. The setting for romance is perfect with a gorgeous backdrop of palm trees, blue skies, a fiery volcano in the distance and inviting ocean. Help the doctor find special love objects that he needs to complete his mission. If you find 5 of his stethoscopes, your reward is between 5x and 100xyour stake. The same reward goes for finding cocktails he’ll need to get set the mood for the couple. To accommodate them, find deckchairs next to each other and win 5x to 125x your bet. Find beach-balls for them and you win 150x your stake. After all the fun in the sand, book them a plane ticket back home and the reward is 200x your stake. Sometimes the guy or girl can get cold feet right before leaving so it will be your mission to find them. Find the guy and get 250x your bet or find the girl and the reward will be up to 1,000x your bet. Wild symbol- Dr. Love acts asthe wild symbol. He can replace all other symbols in the game except the scatter. He doubles all his rewards when he does. Scatter symbol- The scatter is a yellow surfboard. Land 2-5 of them andyou win a reward between 2x and 100xyour winnings. 3 or more scatters will activate up to 20 free spins. Each yellow surfboard activates 4 free spins where all rewardsare tripled. Free spins can be activated again and again. This is a fun twist in the theme of the original slot and it presents a lot of winning opportunities. 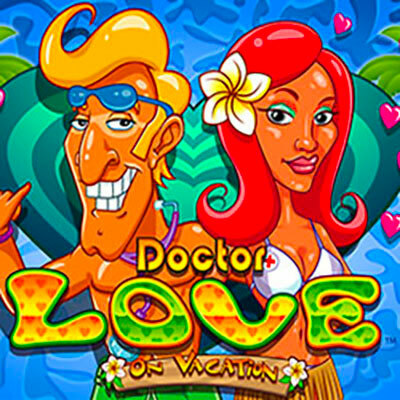 Join Doctor Love for some fun in the sand and win yourself some nice cash rewards. There could have been extra bonuses added to this, but the rewards are pretty okay for now.